There are always exciting new tools, gear, and equipment being developed for preppers and everyone knows Dad likes the new gadgets, or the proven ones that are just plain useful. 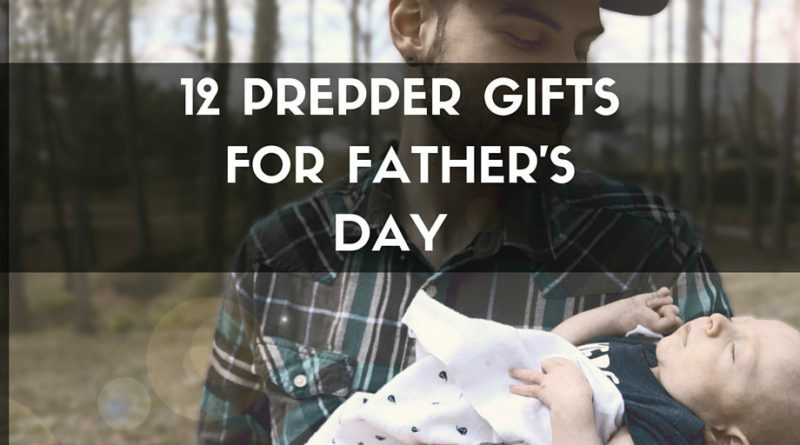 Whether it’s the new solar phone charger or a tried and true knife, one of the gifts below should be just the ticket to having a happy prepper dad on Father’s Day. Father’s Day is coming up soon- it is June 19th this year. The gifts below are listed in order of cost, so you can find the perfect thing for your prepping pops and for your budget. The Gerber Shard is a great addition to any prepper’s keychain, and starts our list of as the cheapest gift. For $5, your dad gets a robust tool that is nearly impossible to break and is useful on any keychain- even a spare. Sure, there are better sharpeners out there but this one has crazy versatility for it’s price and size. You can sharpen a variety of blades, and even get the serrated edges with the fold out tool. The Smith’s PP1 Pocket Sharpener is a great gift, and a great add-on for any knife gift too. Gloves that are durable but also go on quick are hard to come by. Mechanix got these gloves right, and they are a great price of almost half of the more rugged glove cost. Mechanix FastFit Gloves are even more lightweight and great for mobile prepping kits. If your dad is always on the go, these might just be the perfect inexpensive gift for him. This book is great. The skills are very straightforward and blunt, and the pictures are very thorough. While only a few of the skills are usable, the rest of them are entertaining at least. This book would double as a great guide for directing scenes from action movies- the situations it prepares you for are quite over-the-top. This is great if your dad is really into tactical gear and bug out prepping, or if he has a great sense of humor. 100 Deadly Skills is a best seller for a reason, and it’s worth picking up for Dad just so you can skim through it before you give it to him. Just what every prepper needs- more storage. This MTM 50 caliber ammo storage can is a great buy for a prepper, and is the perfect size for small kits. You may be asking yourself “do I really just want to get a box for my dad on father’s day?”, but this is an awesome, rugged, lockable polypropylene 50 cal ammo can and it is perfect. If you still feel bad about buying a box, get something else that is small and put it inside. There is plenty of room, and plenty of room in your budget at this price. Don’t just give your dad some gear for father’s day- give him a skill! Lockpicking is easy to pick up and try, and easy on the wallet as far as hobbies go. This inexpensive lockpicking kit is a great starter kit, with picks and a see through lock to learn how locks work mechanically. Let’s face it- if your dad is a prepper he probably already has a LifeStraw. The LifeStraw, however, is consumable and will run it’s course after drinking through it over a long period. You could buy him a backup LifeStraw, or you could upgrade him to the Sawyer Mini. The Sawyer Mini can filter 100,000 gallons at .1 Microns (the smaller the better). And it comes in a variety of colors, so be sure to snag the one he would like best. A dream for prepping and Dad’s keychain. Small enough to always be there when you need it, versatile enough with 10 tools in one, and strong enough to be used as often as you want. The Leatherman Micra is hard to beat as far as keychain tools go, and picking one up is a foolproof way to get on Dad’s good side. Give him your favorite color so he is reminded of you every time this thing fixes a problem for him- it comes in several colors. If your dad is not a HAM radio hobbyist, this small two way radio makes a great gift. If he has a lot of HAM equipment, he likely already has this or something similar. Other preppers use these as weather radios and emergency communications. Your dad can’t go talking to everyone he hears with this new toy- you need a license for most frequencies. Be sure to pick up the USB charging/programming cable as well, since it is oddly not included. Enable your dad to play phone games off grid with this solar charger. Lightweight and durable- you can even lash it to a backpack while hiking to recharge your phone. The Nektek 20W Solar Charger connects using a USB cable and has a chip to change the amperage it provides based on what is plugged in. It is highly rated, and a great new gadget for your dad on his special day. This backpacking pack is known in prepping circles to be a steal for a Bug Out Bag. The low cost, high volume backpack is able to hold a huge amount of gear and is very comfortable as well. Getting a good fit is very important when picking out backpacks, so we would encourage you to let your dad know to return it if it does not fit well. Or better yet, take him to pick a pack out at a outdoor sporting store (although you may spend a lot more for it). This fixed blade knife is the holy grail of survival knives. Full tang, Made in USA, MOLLE sheath, high polish blade, and G10 handle- this knife has it all. If your father is at all into survival or good, quality knives, the Black Bird SK-5 is a sure bet. It is simplicity and functionality balanced to perfection. I would be thrilled as a father to receive any of these gifts for father’s day, but above all I would value spending time with my family. Take time out to give Dad a call and spend some time with him if you can. Nice list. I will be forwarding to my wife to give her some ideas!